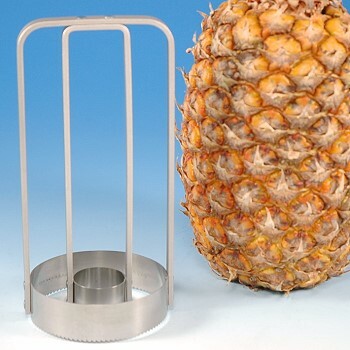 Pineapple Corer effortlessly removes the core and outer skin of the pineapple, leaving only perfect edible fruit. Slice off the green top. 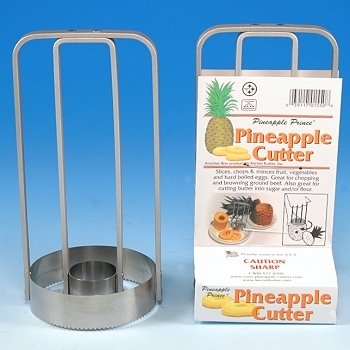 Place cutter on top of the pineapple and press down and twist clockwise until the tool reaches the bottom of the pineapple. Remove cutter. Slice off the bottom rind. Lift off the outer shell and tap out the center core. It's that simple! Slice into pineapple rings or cube into bite size portions. Dimensions: width 3 5/8", height 7 1/2"